The Isle of Wight Car Club made a welcome return to the grounds of the Ventnor Botanic Garden. The Ventnor Botanic Gardens is a picturesque venue on the south side of the Island sheltered form the cold northerly wind by the Ventnor downs. It contains many tropical trees and plants and is not the normal place that you would expect to see motor racing, however, the owner kindly allowed a large section of the garden to be closed, so that the Isle of Wight Car Club could run an autotest. This unique event encouraged current members to bring some exciting cars out of storage and entice new members to join the club and have a go. The slight down side to this event is, that, if you were to push a little too hard and leave the course due to being over enthusiastic, the penalty is, that the flora and fauna and not to mention a scattering of rocks are very unforgiving. Class one cars are unmodified cars under 1400cc. Steve Glass drove his MGZR to this class win pipping Hanna Thomson by only a few seconds. Hanna, however, was awarded fastest lady of the day and it must be noted she was also faster than Brian Robbins and Dan Young who were also driving her car. Class 2 is for unmodified cars over 1400cc and Dean Long in his MX5 was a joy to watch proving slow is smooth and smooth is fast. Dean Long was unable to accept his class winner’s award at the podium celebration as he went home to kindly lend his van and trailer to the Lower family as their car had suffered irreparable damage during the last run and as they had made the trip to the Isle of Wight from the mainland in the car they were competing in were rather stuck with no way of getting home. So I would like to say a big thank you on behalf of the club to Dean and Tony for helping the Lower family in their hour of need. As a small compensation Zach Lower managed to claim class 4 honours and 3rd place on the podium before the car was damaged and we are assured the car along with the Lowers will make a return. Class 3 went to Adam Greenen in his classic Mini. Class 5 is the domain of the specials and Lowcost cars, however, Michael Marrison in his class 5 Puma powered Fiesta again wowed onlookers by out-performing other more performance orientated cars and finishing in 5th place over all. Chris Wilson took the 2nd step of the podium in his special but with a huge lead taking the class and overall win as Ryan Munt. 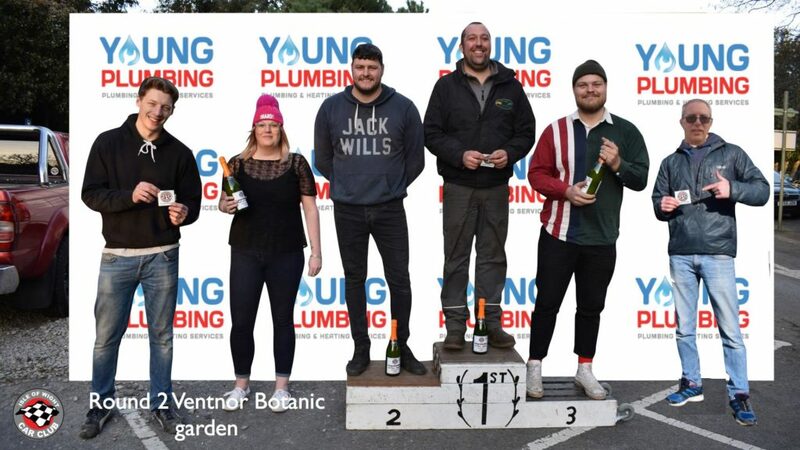 Thanks to the success and generosity of the Ventnor Botanic Garden the Isle of Wight Car Club hope to return to this venue for its final round of the year.